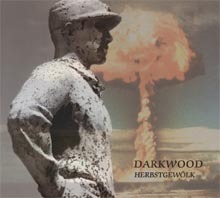 This hypnotic release gathers 10 of the darkest and most threatening Darkwood tracks. Joined on this recording, they develope and display their own charm of despair. Strange noisescapes alternate with quiet acoustic instruments, weird samples, and stirring vocals. "Herbstgewölk" deals with a secret science, its final hope and its final curse. The CD is delivered in a beautiful digipack.